This program offers a walk visiting places connected to Osamu Dazai, who was born in the Kanagi district. 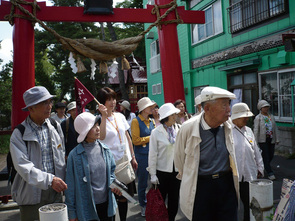 During the walk, participants will be introduced to his work, Omoide (Memories), and essays he wrote when he was at Meiji Higher Elementary School. There will also be an opportunity to taste famous local confections and learn the historical background of his birthplace. There are 2-hour and 3-hour tours to choose from. The 3-hour tour includes lunch. ※Make reservations at least 3 days in advance. Osamu Dazai Memorial Museum "Shayokan"
Copyright(C) Goshogawara City sightseeing site All Right Reserved.